This is from Gelo Basuan of Las Pinas. I remembered the day my wife and I first met this old lady 3 years ago on our way home to Las Pinas. It was summer of 2009 and the sun was scorching hot at 11:30am. There was heavy traffic along Naga Road and everyone was quite irritated. When we saw the cause of the traffic, our heart melted and we felt guilty to see this 83 to 85 year old lady pushing a big heavy cart of trash. 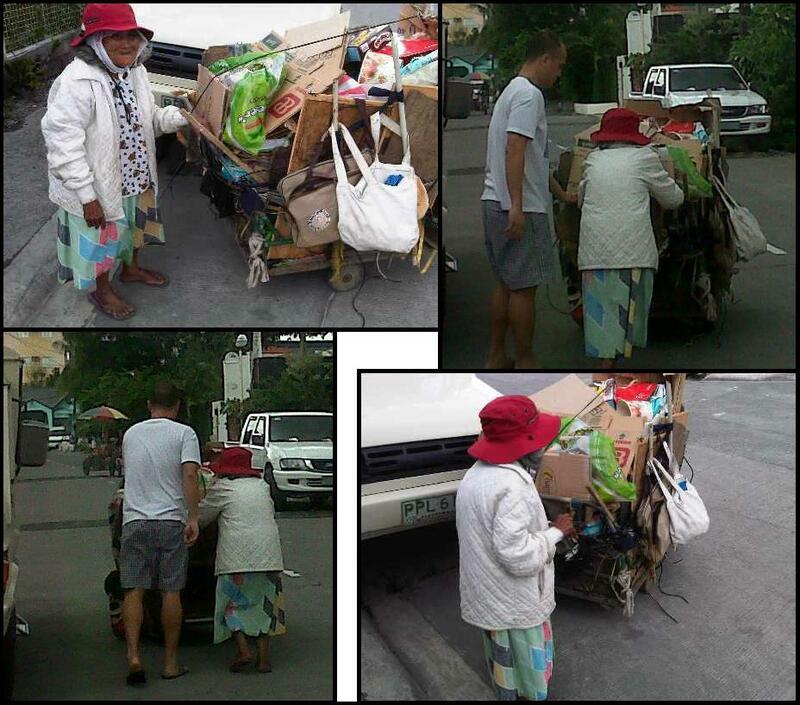 She wasn’t able to control the cart and tends to get in the way of the traffic because of her poor eye sight. We couldn’t stand what we saw. Since we were almost near our home, my wife and I decided to get some food and money. We went back and helped the old lady. We had a quick conversation while helping her. Despite the old lady’s condition, we find her very cheerful and positive. We never heard her complain about how heavy her cart was, how hot was the weather or how long she’s been walking to get the things on her cart in order to sell it to support her grand children. We realized we are so blessed. She was so inspiring. And what inspires us most is she is not asking for alms or money, she works hard to earn it. Since then I often see her whenever I jog or play basketball along Camella 3D, Camella 3C, St. Joseph and Naga Road, pushing her heavy cart as always. I see to it to give her what I have in my pocket during that time and help her push her load until we would separate our ways. Yesterday we were driving along St Joseph and again, we saw her. She didn’t realize that she was going at the middle of the road. She continued to push her cart and bumped to a parked van. Looking back, it has been 3 years and she’s still doing this stuff. There were a lot people along the way and there were only few who offer help. We are also asking the attention of the City Government of Las Pinas and other concerned organizations that can help. We tend to complain about our work and this experience helped us realized to be thankful for whatever we have and work hard for our family. This old lady showed how happy and thankful she is with her simple life. ALDRIN SAN PEDRO should be SUSPENDED and the OMBUDSMAN should make a LIFESTYLE CHECK, KAPAL NG MUKHA MO, PINAGMAMAYABANG MO PA MGA BAGONG SASAKYAN MO SA SUSANA SA MGA JOGGERS DUN, HAYOP YOU’RE THE MOST CORRUPT MAYOR OF MUNTINLUPA< MAYAMAN KA PA KAY CORONA, PNOY SHOULD LOOK AT THIS, HAVE MERCY ON MUNTINLUPA PEOPLE !!! MODERATOR BAYARAN KA BA NI OMAR ACOSTA !! !